"If you’re looking for a natural, safe odor remover, Angry Orange should be your first choice." "One of the most highly rated enzyme cleaners you can buy, known for its ability to wipe out odors and eliminate stains." "Great for seemingly impossible-to-remove smells and stains." "Breaks down the harmful bacteria that causes strong smells and leaves behind a minty fresh aroma." "Cat stain-specific formula targets bacteria found only in cat urine, and eliminates the ammonia to restore your carpet." "With an organic 'green standard' formula, it’s an effective way to treat pet stains without chemical additives." "A powerful tool for uncovering any left-behind bacteria that draws your kitty to the same spot again and again." "Makes exposed litter boxes much more pleasant, but doesn’t deter cats from using the box." Angry Orange is a commercial-grade odor eliminator that was originally created as an agricultural product aimed at eliminating livestock odors. Unlike many of the other commerical-grade odor eliminators, Angry Orange uses a non-toxic formula made from the oil found in orange peels. Owners also rave that because of its origin, it smells much better than competitor products. Angry Orange can be used on carpets and hardwood, but also outside to eliminate odors from bushes or grass. It also comes with a 100% money-back guarantee, so if it doesn’t reduce the smells from your cat’s accident, you can get a full refund. Many reviewers claim Angry Orange is the only product that effectively removed all remnant cat pee odors and, most importantly, stopped re-marking accidents by eliminating the ammonia smell left behind. If you’re looking for a natural, safe odor remover, Angry Orange should be your first choice. An enzymatic cleaner is one of the most powerful tools to eliminate cat odors and correct re-marking in the same spot. They work by breaking down the acid in cat urine and using helpful bacteria to neutralize the bad bacteria in cat pee. Rocco & Roxie is one of the most highly rated enzyme cleaners you can buy, known for its ability to wipe out odors and eliminate lingering stains from urine and vomit. It’s safe around pets and chlorine-free, so you don’t have to worry about it discoloring your furniture. Reviewers rave that it is a great pre-treatment for laundry as well, which is handy when your kitty decides your laundry basket is his new litter box. 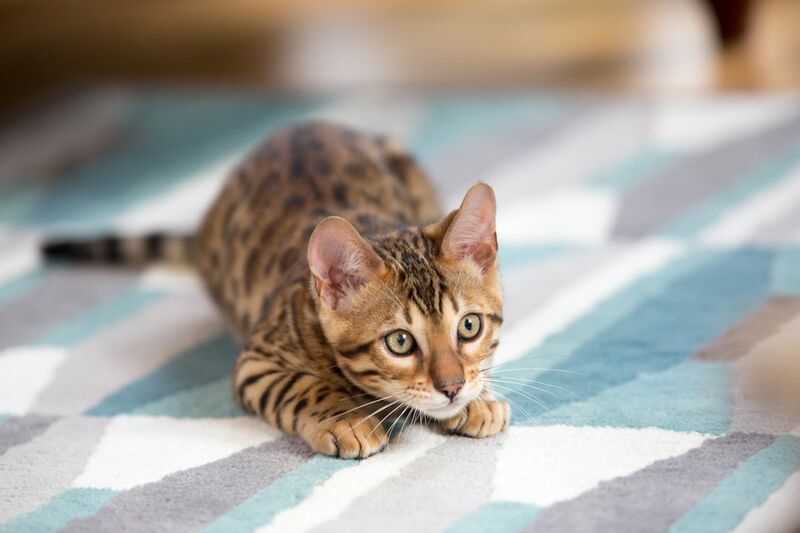 One owner states that it even saved her hardwood floors after a penetrating cat odor nearly cost them thousands of dollars in damage. Bubba’s odor eliminator is another enzyme cleaner that is great for seemingly impossible-to-remove smells and stains. It comes in a gallon-sized container, and is ideal for home carpet cleaners and steam machines. Bubba’s uses dormant bacteria that doesn’t become active until it hits the stain, making it an incredibly powerful tool in the fight against cat pee. Owners say that Bubba’s is a great choice when other products haven’t done the job, stating that it’s even eliminated long-standing odors and year-old stains. Like other products, Bubba’s also offers a money-back guarantee if you’re not entirely satisfied with the product. Sunny & Honey is the number-one enzyme cleaner on Amazon, and it has the amazing reviews to back it up. It works like other enzyme cleaners to break down the harmful bacteria that causes strong smells, and leaves behind a minty fresh aroma instead. Sonny & Honey also offers a 60-day money back guarantee, which is enough time to test the product throughout your house. Though it’s made for pet odors, many reviewers have successfully used Sonny & Honey for mattress stains, human messes and even chemical odors. It’s an affordable enzyme cleaner that not only works to eliminate odors, but actually pulls hard-to-remove stains from carpets, bedding and more. Nature’s Miracle is one of the most popular urine odor eliminators on the market, and for good reason: it works. It started out as a cleaning agent used in preschools, and turned into one of the best-selling pet products on the market. This cat stain-specific formula targets the bacteria found only in cat urine, and works to eliminate the ammonia to restore your carpet or furniture. It also help eliminate re-soiling by using a lemon scent, which is a common cat deterrent. Using Nature’s Miracle is incredibly easy, as it requires no scrubbing or blotting. It works by drying on the stain to lift the odors from underneath. Owners love Nature’s Miracle because it’s easy to use and straightforward, requiring no diluting or mixing like some other enzyme products on the market. Looking for an all-natural spot stain remover to lift those unsightly patches on your rug? This odor remover from TriNova should do the trick. With an organic “green standard” formula made with a blend of natural enzymes, it’s an effective way to treat pet stains without the chemical additives featured in some products. Reviewers state that it’s easy on rugs and carpets, and is gentle enough to work on hardwoods too. The TriNova stain and odor remover is a solid choice to neutralize pet smells and lift stains, and the all-organic formula ensures it’s safe around pets and kids. The UV Stain Detective is a must-have sidekick in your fight against cat urine odors. A UV blacklight helps you spot leftover and dry urine spots that are undetectable to the naked eye, allowing you to focus on spots that cause lingering smells. The UV Stain Detective is compact and easy to store, but is a powerful tool for uncovering any left-behind bacteria that draws your kitty to the same spot again and again. It’s best used in low light, so save your detective work for evenings. Reviewers say the UV Detective has successfully saved many carpets from the dumpster, allowing pet owners to hone in on spots that cause odors. Pair this blacklight with a great smell-eliminating product, and you’ll be able to tackle any cat odor that comes your way. Cat pee odors don’t just come from accidents around the house—they can also penetrate into your floors and walls from a smelly cat litter box. Even the most diligent cat owner has suffered from an overly fragrant litter box, but NonScents cat litter deodorizer neutralizes urine and feces odors before they can permeate your house. It’s scent-free and doesn’t contain any chemical additives, making it safe for daily use in your cat’s box. Just sprinkle a thin layer over the cat litter each time you change it, and you’ll no longer dread walking by the litter box. Reviewers say it’s made exposed litter boxes much more pleasant, and doesn’t deter cats from using the box. Unlike most cat litter deodorizers, NonScents doesn’t mask the smells with a fruity or minty scent—it actually eliminates them.